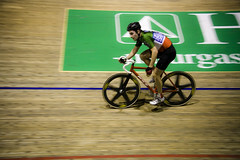 I was at the Copenhagen Six Day Race last Saturday and it was brilliant For the past century the Six Day Races were a major event on the Copenhagen calendar. They live on each February in the Ballerup Super Arena but everyone laments the fact that they are no longer held in Forum, close to the city centre, where they were held between 1934-1997. 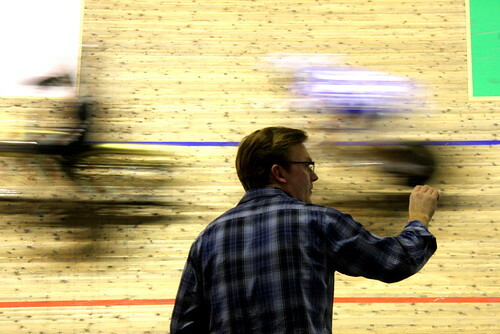 Nevertheless, the event is still festive and, most importantly, still the purest form of cyclesport for the people. 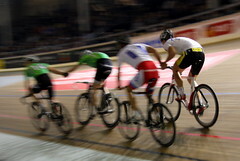 The Six Day Races [The Sixes] have a long history since their conception in 1878 in England but I'll let the Wikipedia page on Six Day Races tell you all about that. 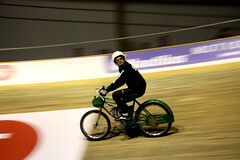 Gone are the days when the riders rode for six days straight - with one of the pair required to be on the track at all times. At night things were quiet, as you can see in the photo. 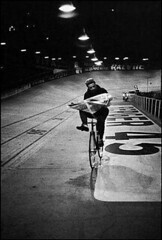 Time to read a newspaper whilst cycling around the track. His partner was catching some sleep. 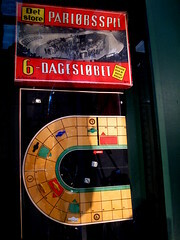 Gone are also the days when the nation's film stars featured in a film based on The Sixes or children and families played Six Day Race board games. Alas. Now they race for six days but in the evenings. 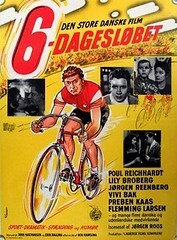 In the case of the Copenhagen race, from 19:30 to 00:30 ish, sometimes later. 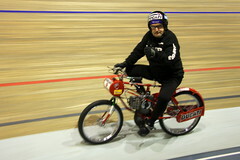 Last Saturday I was at the race with the good people from Biomega and Hans from Larry vs Harry. Beer and Bicycles were on the cards. It was my first time at The Sixes. When I worked at Danish Broadcasting a few years back I had the chance on a project to work with old archive footage from the past 80 years. Most of it sports. So seeing a few hours of footage from the 'good old days' of The Sixes has given me the sense of being there before. Nowadays it's more sterile in a way, but still a fantastic experience. 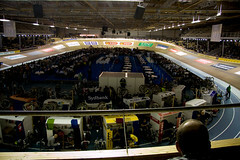 The crowd on Saturday was mix of families, quiet older gents sipping pints, young bucks on a boys night out and couples in suits, furs and heels having dinner in the middle of the arena, surrounded by humming bicycles. I was in the VIP event area in the middle, at one end. Up close and personal on the steep bank. A tradition in the Copenhagen race is that it's an honour to be given Pair #7 and it's usually an all-Danish partnership who get to wear the 7. 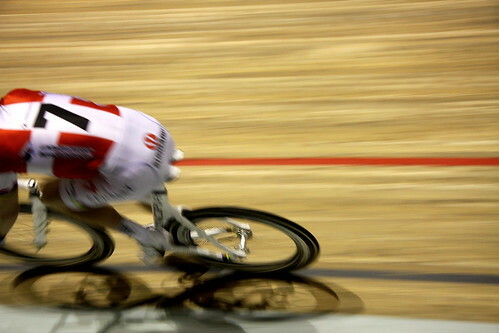 This year it was Alex Rasmussen and Michael Mørkøv, defending world champions to boot. So the local crowd knew who to watch and cheer for. The pair annoyed Berliners the week before by winning the Berlin Sixes. In the course of the evening The Sixes offer a potpourri of disciplines. It's hard to keep track, actually. Fortunately there is signature music that booms out of the speakers when the final sprint. Actually, music is a major factor and the races are not unlike being at a concert with a crazy medley of music from 50's rock to 00's pop. Punctuated by the traditional Sixes melodies. Who do you think will be best? Even though he's let me down so often. Keep your good humour and ride. Like I said, this really is cyclesport for the people. The Tour de France, in Europe anyway, has long been released from the possessive grip of 'sport' and has been siphoned down into a broader cultural sphere. Still, in the modern era you get the sense that you're somehow separated from the riders by the glass wall of celebrity and sponsor cash. The Sixes maintain their close contact with the crowd. Just look at the film, above. When the riders - all professional cyclists - were doing the preliminary laps of the final 60 minute pursuit discipline, they did the wave with the crowd. Three times! Before getting down to business and racing like the wind. In the breaks I saw a Swiss rider chatting up four girls at a table nearby. 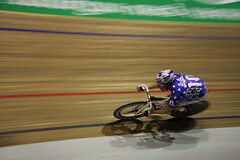 Him on his bike on the track, holding onto the boards and flirting. Brilliant stuff. 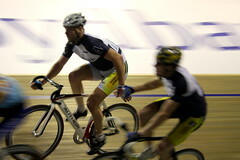 And he was leading the race, with his partner, on Saturday. Another tradition is that different sponsors offer up different prizes for the various sprints/events. One rider will win a washing machine. Another will pocket 500 kroner a fancy bottle of wine. On top of their paycheques, of course. All prizes that the crowd can identify with. The close proximity to the riders adds to the folksy feel. You spend 5 hours with them as they keep roaring past and when they have a break, you can peer down into their boxes while they relax with a massage, check their mails, whatever. The fact that in the Derny events the pros get to ride behind cool cats like these certainly adds to the folksy aspect. The chap on the left looks like half the men in the crowd, even though he's a legendary pacer from Belgium. And on the right is Australian Danny Clarke, legendary Sixes rider with 74 wins - 8 of them in Copenhagen. He sang a couple of songs - My Way was one of them - with the band after the Derny race. Anyway, here's the Flickr set of all the photos from the cracking night out last Saturday. Nice to see that there is a pocket of sport that still keeps a close relationship with the crowd. Just like all sport used to be. And still should be.